Jaguar Land Rover Special Vehicle Operations (SVO) has revealed the most powerful, agile and extreme performance Jaguar road car ever - the 200mph, 600PS XE SV Project 8 sedan. The second Collector's Edition by SVO, following the successful F-TYPE Project 7 of 2014, Project 8 is a hand-built four-door sedan with supercar performance - designed to thrill driving enthusiasts, with an extraordinary combination of explosive power, dynamic agility and all-wheel-drive traction. To ensure exclusivity, no more than 300 examples will be created, each assembled at SVO's Technical Centre in Coventry. John Edwards, Jaguar Land Rover Special Operations Managing Director, said: "SVO's raison d'etre is to produce halo vehicles that push the boundaries in terms of luxury, performance and all-terrain capability. Project 8 is a great example of what happens when enthusiastic designers, engineers and manufacturing specialists are given the opportunity to create an extreme performance sports car without compromise. "Project 8 will be assembled by hand in the new SVO Technical Centre, and we're confident that our enthusiastic and demanding clients will love driving Project 8 as much we do!" Project 8 exclusively features the most highly tuned version of Jaguar Land Rover's 5.0-litre Supercharged V8 petrol powertrain. The 600PS power unit, which has a Titanium Variable Active Exhaust, is complemented by Jaguar's All-Wheel Drive (AWD) system and motorsport-derived aerodynamics to deliver a 200mph top speed and 0-60mph in 3.3sec, making Project 8 the fastest accelerating Jaguar yet. Fundamental to the performance of the most track-focused car SVO has ever produced, Project 8 features a number of purposeful modifications to the award-winning XE's lightweight aluminium body panels, including: Carbon Fibre Bumper with enhanced Cooling Ducts, vented Carbon Fibre Bonnet, flared bodywork covering 20-inch forged aluminium alloy wheels, adjustable Front Splitter, Flat Underbody, rear Carbon Fibre Bumper, rear Diffuser and adjustable Rear Aerodynamic Wing. Project 8 will be the lightest V8 sedan in the Jaguar range. Mark Stanton, SVO Director, said:"We have really been able to unleash the potential of our engineering and design teams in specifying Project 8. We are at the beginning of a very challenging and exciting development programme which will see us focus on ensuring Project 8 delivers track performance on a level previously not targeted by Jaguar. "The SVO team is full of performance car enthusiasts that are now briefed to deliver motorsport science and soul in what is effectively a four-door supercar." 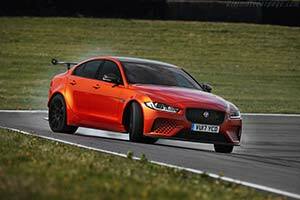 To ensure optimum performance on road or track, Project 8 endows the XE's double-wishbone front and Integral Link rear suspension with stiffer springs and manually adjustable Continuously Variable Dampers (giving a 15mm lower ride height for track use), debuts a new Carbon Ceramic Braking system, an industry-first use of Formula 1-style silicon nitride ceramic wheel bearings on a road car, and incorporates a rear Electronic Active Differential (EAD) with oil cooler - a first for XE. The high-performance theme continues inside, with subtle applications of Gloss Carbon Fibre trim as well as Alcantara, on the rim of the Project 8 Sport Steering Wheel, instrument binnacle and door cards. The eight-speed Quickshift transmission can either be operated by aluminium paddle shifters behind the steering wheel or by a central Pistolshift lever - another first for XE. Project 8 will be available in two specifications at launch. The standard four-seat model features Jaguar's latest front Performance seats with magnesium frames, plus a more heavily contoured rear squab to maximise support. The optional two-seat Track Pack includes lightweight front Carbon Fibre Racing Seats with Four-Point Harnesses fixed to a Harness Retention Hoop in place of the rear seat. All Project 8s will be built in left-hand drive configuration only. Full details of Project 8 are now online at www.jaguar.co.uk, including eight body colour choices - three eye-catching standard colours: Fuji White, Narvik Black and Caldera Red, plus five enhanced SVO Design options incorporating colours and finishes from the SVO Premium Palette: Valencia Orange, Velocity Blue, Meribel White, Verbier Silver and Corris Grey (satin matte). Project 8 owners will also be able to personalise their car by opting for further colours and finishes from the SVO Premium Palette range, which includes 19 colours in tri-coat, tinted clear coat, pearlescent, ChromaFlairTM and satin matte finishes. Race-inspired decal packs, accentuating Project 8's high-performance attributes, are also available.